A permanent new stone cathedra (or bishop's chair) has been installed into the Cathedral of St John the Baptist in Norwich, the mother church of the Diocese of East Anglia. The cathedra is the seat of the bishop, now complete with two stone deacons' chair next to it and surrounded by stalls for priests and deacons to sit in. 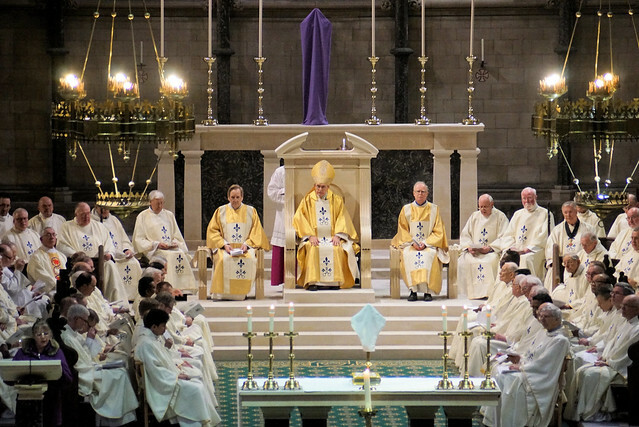 The installation and reordering of the sanctuary was completed in time for the Chrism Mass on March 27, when it was blessed and first used by Bishop Alan. The cathedra is the symbol of the bishop’s authority to preach the gospel and to teach the Catholic Faith, and to celebrate the Liturgy. Bishop Alan said: "The refurbishment links us across the ages with the early Church. Now, when we stand at the back of the cathedral our eyes travel first to the altar where the Holy Sacrifice of the Mass is offered; then on to the cathedra, which makes this building a cathedral, and from which the bishop preaches the Gospel and teaches the faith; on to the figure of Christ crucified, by whose death and precious Blood we have been redeemed; and so finally on to the wonderful stained glass of the east window which reminds us of the saints in the glory of heaven - the destination of our Pilgrim journey. "I would like to thank the Friends of the Cathedral and the anonymous donor who have helped us to add to the beauty of our already beautiful cathedral," said Bishop Alan. The work has been paid for by the Friends of the cathedral, whose chairman, Jeremy Evans, said: "This restores our cathedral to the vision that the architect George Gilbert Scott had for it when he designed what was originally a parish church, only becoming a cathedral many decades later in 1976. "This work is a part of our ongoing commitment to further enhance the beauty of what is the second largest Catholic cathedral in the country, behind Westminster. Our next project is to work with the Dean in reordering the Chapel of The Most Precious Blood. "To be able to continue with our work we are always thinking of fund-raising events and are currently planning something for the summer. We also need new members, so if you would be interested in joining us and being part of what we do then do please contact me at jeremy.evans@hampden.co.uk or ring on 01787 210146, or at The Mill House, Leavenheath, Suffolk, CO6 4PT."